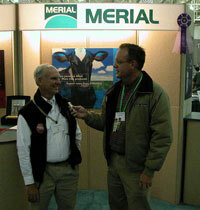 The National Dairy Shrine has an exhibit here at Expo and some of its board members like Tommy Martin, seen here on the left. Tommy is an old friend of mine that I haven’t seen in over 15 years. He’s also here working for Merial. National Dairy Shrine brings together dairy producers, scientists, students, educators, marketers and others who share a desire to preserve our dairy heritage and keep the dairy industry strong. Founded in 1949 by a small group of visionary dairy leaders, National Dairy Shrine now has over 17,000 members encompassing virtually every facet of the industry.